The year is 1943. You were having a fantastic day in your highly-paid, no-questions-asked US Navy post until you took part in the top secret ‘Philadelphia Project’. It was supposed to make the ships invisible to radar but something went terribly wrong and suddenly an entire island materializes out of thin air next to the USS Eldridge. As you run across the deck, you too begin shifting in and out of existence, ending up ashore of the mysterious island, a few seconds before witnessing your mighty example of naval firepower vanish from sight. You are now stranded with nothing in your person in this eerie place. In the distance, you make out a Tesla Coil tower discharging energy to… somewhere. However, when you begin looking around your immediate surroundings, nothing in your years of naval training could possibly prepare you for this. Adrenalin rushes through your body as fear takes a hold of your reasoning; You are now in… 'The Early Access Zone’. 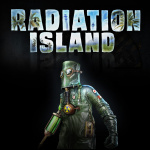 Atypical Games Radiation Island is primarily a survival game with some big aspirations (not many games in this category let you fly on a para-glider). If you are familiar with the genre, you will quickly find your footing in this mysterious place by doing the usual tasks expected from this sub-genre; you must gather resources in order to keep starvation, the cold of night or the local wildlife at bay, preventing the later from turning you into their next meal. If you are new to this genre, the game gently eases you in all the proceedings via tutorials to make sure you end up understanding the core concepts of gathering, crafting and surviving a night on this hostile piece of land. 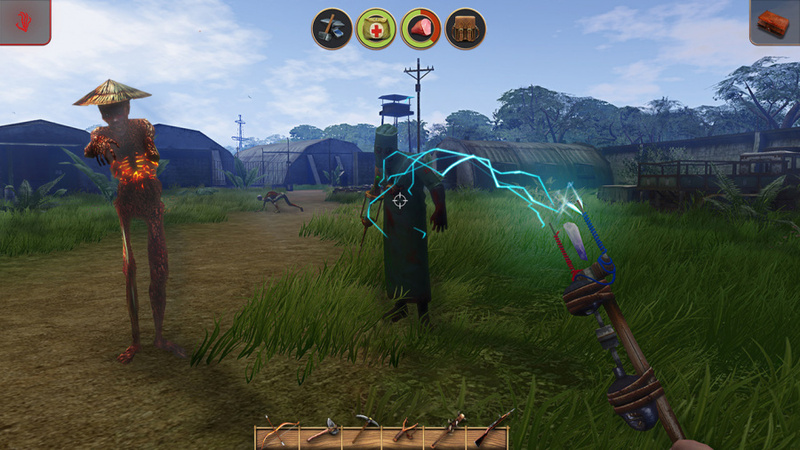 Within a dozen minutes you will know how to gather resources, craft tools, weapons and clothing, feed yourself, use fire to both keep you warm at night and fend off the local fauna. From this point onward and with the basic concepts down you are free to explore the generously huge island and surrounding ocean, trying to piece together the mystery surrounding this place. Sadly, this is where the game falls completely apart. Of course, we're not expecting every developer to have the resources needed to make AAA quality games - even more so when you consider the mobile origins of this product. As such we do not hold against it the usage of low detail, low polygon assets with some very basic animation cycles (including your own virtual representation, which you will only find out if you use the third person view). However (among far too many other examples) when we were tracking a wolf and we ended up running in circles around a tree until we realized the wolf was inside the tree (after the poor creature’s low poly count snout clipped trough the tree bark) we had to face the harsh reality: Radiation Island is simply not a finished product. A real shame that because the premise is rather interesting, the survival game mechanics are all implemented and working properly yet everything else sadly isn’t. So as much as we would love to explore the entire world, the whole place sadly keeps reminding us every step along the way that this would benefit from a complete makeover and several more months in development. Oh, did we forgot to mention the entire human population of the island has been turned into veracious zombies? We probably are still trying to forget our first time encountering one such local denizen, a moment that should have been filled with surprise and horror, but the model was so poorly made and shoddy animated we could not believe this was being sold as a retail product. This might be an acceptable level of quality on the mobile market or as an Early Access title on Steam, but we expect more from a game that's appearing on Nintendo Switch and the Switch eShop. 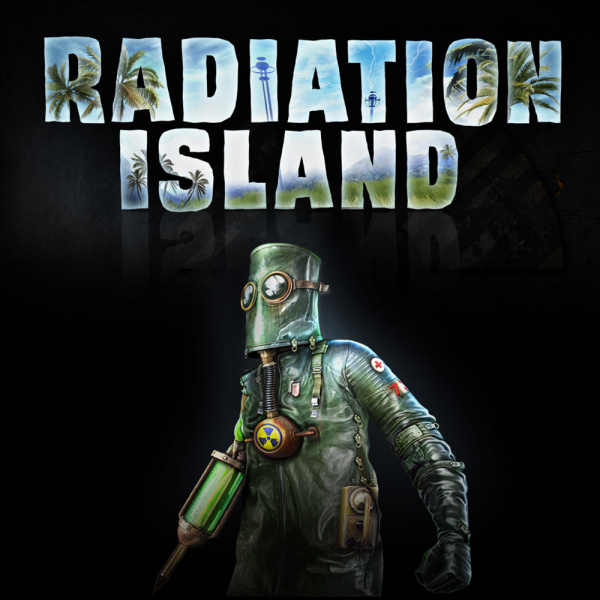 Radiation Island is a good survival horror premise that sadly never delivers. We are unsure if the game will continue to see future support and updates to better streamline the entire experience, possibly leaving it in this limbo state on Switch forever and as such our final score reflects the game’s current state. It's a shame Atypical Games decided to bring this game to Switch before other games in its catalogue as it sets a dangerous precedent on the eShop. Buyer’s beware: the titular radiation is the least of your worries on this island... but that hole it will leave on your wallet most certainly is. 2 terrible Switch reviews in a row. Signs of the End of Days. Guys, I actually really enjoyed this game. I've played it and had a lot of fun, it doesn't feel like an early access title. Ambitious, but unfinished. Don't I know that feeling. Tis a shame as it looked interesting if not a bit bland graphic wise. @VehicularVehicle ...you never fought a wolf inside a tree, have you? I would at least give the game a 5/10, and this review doesn't even address the game's biggest fault, which is simply collision detection. 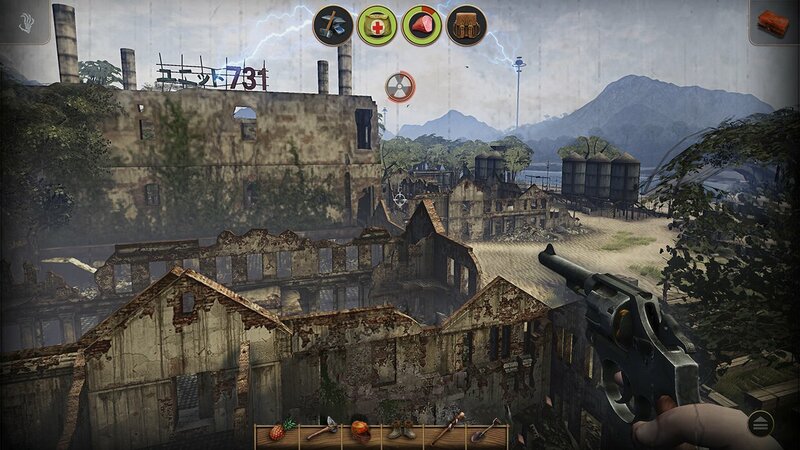 They also didn't mention the 3 difficulty settings, one of which turns off all combat, allowing you to just explore the island, knock down trees, and complete your objectives safely. You can also play in 3rd person by pressing the right stick. For a mobile ported open world game, I think it's kinda gorgeous at times, and it runs at 60fps! I'd recommend it to open world fans who know they aren't too hard to please. I'm going to post some screens in the screenshot thread when I get home. 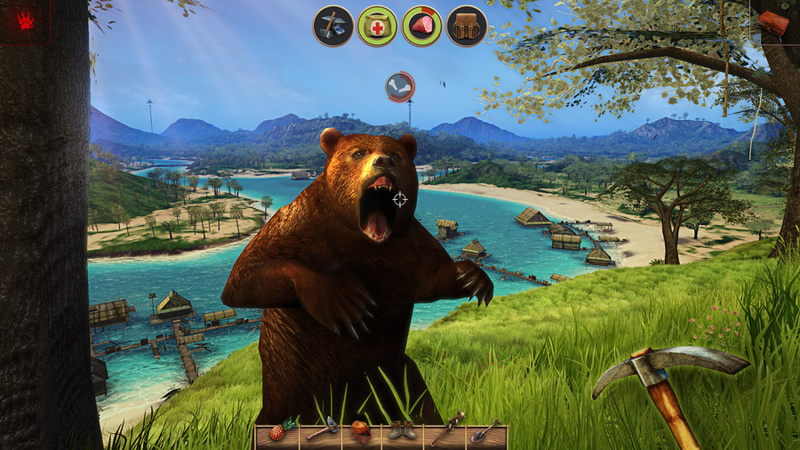 The screenshot with the bear has been removed from the review. It reminded me of Cabela's Dangerous Hunts 2013 on Wii and was just as ugly. Edit: The screenshots have been changed again. I played this on the iPhone and thought it was pretty bad, was hoping they improved it for the Switch. @Shiryu I haven't had issues. This really isn’t that bad, maybe a 5 or 6. Definetly not a AAA game, but I have played a lot worse games. And $10 is cheaper then hollow. Seems like the reviewer had their mind made up before writing review. Did they play and beat game or just finish tutorial and after another hour give up? Lots of missing details. how can people really complain about graphics when games like Minecraft exist and are incredibly popular? This game isn’t going to blow anyone away, but if you like these types of games, you would like this. @VehicularVehicle You must have been severely lucky then. This is why getting all these games is both a blessing and a curse, and I know I will be checking out reviews of every game that is released on the E-Shop unless it comes from a developer I know I can trust. @McGruber Thanks for pointing that out. I did sadly forgot to mention you could just play in exploration and walk the whole place up and down. Mea culpa. @SLIGEACH_EIRE Make a good will comment for once. Your sense of sarcasm needs severe repairing. Oh man, this is a drag. The premise sounded like it could have been the next Stalker, though the game's low profile suggested a rushed release. Thank goodness Nintendo Life is covering these games! I wondered what it was, but as soon as I saw it's in first person I was no longer interested. Then I read the rest of the review and it got worse. I liked "The Early Access Zone" quip. Truly these type of games plague the service. @SLIGEACH_EIRE In a week with 22 releases or so you can't expect 22 masterpieces. I think Mulaka and Outlast will score good enough, and Little Triangle seems decent, too. @SLIGEACH_EIRE you know it is bad when the free DEMO of Aliance Alive and Yakuza 6 Are more worthwhile than anything launched on the Switch in the last 2 months. This game sells for $3 on steam, didn't get many patches. This game reminds me of a bad B movie that I just have to watch. I just can't explain it. Wish they had a demo. That bear picture with the pickax... is a helluva thing. Well it was born as a mobile game, so I’m not surprised. Not saying that mobile games are crap (in fact I have lots of great games on my old iPhone6 like The Banner Saga, Joe Dever’s Lone Wolf, Alto’s Odyssey and may more), just that I rather trust a game developed expressively for consoles instead of a port from mobile to consoles. @SLIGEACH_EIRE the screen shots are random I believe and change. In all honesty I picked it up cos it was pretty cheap but looked pretty crappy so was expecting it to be awful but ended up having alot of fun playing it. The ai is terrible and the models are pretty terrible but the gameplay works fairly well. I like how they did the crafting and once you find a gun, the game becomes a hell of alot easier and ultimately more fun. Played for 14 hours so far, only just got to the 2nd island but definitely intend to complete it. You clearly have an agenda to bash “filthy” mobile-born games on the Holy Switch. This is not GotY material for sure, but it has its moments. I had some hope for this game but I was never really expecting much. Otherwise there are plenty of other alternatives that are much better games. WOW. Don't agree with this review at all. This is definitely a 6 for me. It's not great but it is fun. @slider271 I have It on Steam. That is good enough for me. Hopefully it does ok on Switch. I have to agree with the many posters on here who enjoyed this game. I took a punt and I have to say that it’s a lot of fun. I’ve spent several hours on it so far, the crafting is great and the gameplay reminds me of Far Cry Predator on Xbox. Yes it’s rough round the edges but for the price there’s a lot of gameplay. I hope they release Radiation City on Switch too. For $10 this game is not too bad. Sure the AI is not the best, like when you hit a sheep with a pickaxe, sometimes it just stands there eating till death. Gathering and crafting is pretty good. The game has it's ups and downs, but overall, it's kinda fun. Shame, I quite liked the premise of this one but it seems a bit of a dud. Ah well, plenty of other games to play. The joys of having decent support beside just Nintendo games. It sort of has a ZombiU quality to it. Maybe even Farcry from the Wii launch. Both games were immense in scope but, severely lacking in follow through. I highly enjoyed both though. Especially ZombiU. I may get this when it's on sale for $5. Sorry but for 9 bucks it really worth the plunge ! I really like this game. You have a lot to do and the ambiance are excellent. OK there're some bugs but there're not game breaking bugs. There is a wolf in a tree ? Ok let it go and keep on your way. And some scenery are pretty beautiful. IMO, Gonçalo Lopes is a better reviewer for shoot'em up seing that all of his reviews about some shooter are at least rated 8 ! But for this kind of game, it would have been better to give it to someone else. I'd have given this game a 6 or 7. I was watching a zombie with a sword running in circles after a bunny . @gurtifus Thank you for spelling my name correctly! I gave it a 5/10, I feel it’s quite ambitious but overly tedious with clunky controls and a god awful inventory and item management system. Early on I was just filling every chest with the stuff I found and it was so annoying transferring stuff while playing docked. If this was better implemented I would rate it higher. I don’t care about graphics as much as gameplay, but they really weren’t even bad, similar to the original far cry game. I found a lot of similarities with far cry 1, mostly the setting, and hoped it would be a nice combo of Far Cry and Stalker, two of my absolute favorite pc gaming experiences of all time. It’s a big mess, however, and I don’t see myself ever WANTING to play it, I really had to force myself to play it and give it an honest chance and pretend I got my money’s worth, lol.